I’m having my 1st Blog Giveaway! Why? Because Life is Good that’s why! 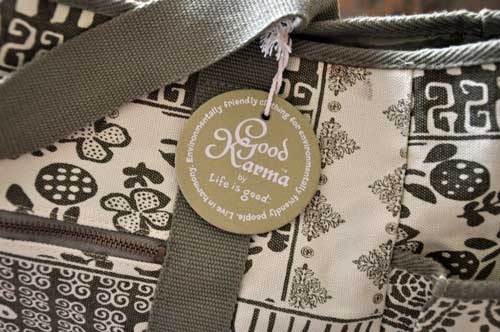 Here’s what I’m giving away… Life Is Good Gym/Yoga/Book bag! And this adorable Life Is Good Hat! I have tons of Life Is Good hats that I wear when I work out or when I’m running errands and don’t want to “do” my doo! You could just fold the bag and keep it in the car and use it for a grocery bag or keep your journal and current books in it and tuck it next to your bedside! And if you aren’t a hat-person pass this one along to brighten someone else’s day! All you have to do is leave a comment telling me one reason that Life Is Good for you!!! Take a moment to comment…don’t leave a girl hangin! Love and smooches and hugs to you my Peeps…I’ll post the winner (from Randomizer.org) on Monday March 30th! Life is good for so many reasons! I’m fortunate to have a wonderful family and many great friends. Thanks for entering me in your drawing!!! Life is good cause I get to wake up to a small lil man who loves me, no matter what my hair or makeup look like, everyday!!! And because I have a beautiful new cousin who I can’t wait to meet!!!! Because summer time is coming!!! Time to dance on the beach! I don’t think I’m supposed to comment on give away day but I couldn’t help myself Susan….I just had to give a hearty AMEN! And : “YEA GOD”!!!!! life is good, because God is good!! Life is good because God always picks us up when we fall and uses us to help others know him. I love it! How sweet of you, GiGi! Despite the fact I woke up to a raging blizzard! Yes, Robin, tons of snow! Again. And despite the fact we are in the midst of a battle against a flood that is threatening to invade most if not all of our city. Life is good, because every day people by the busload are showing up to help us. Complete strangers are pitching in to save our two neighboring towns and it is an awesome, amazing example of why life is good. I may make this my mantra today! Life is good because my family is healthy and my husbands business is still doing well in this economy!! Life is good because God is good. He is faithful to bring new friends (like you!) and encouragement…He is faithful and merciful every morning! AND, He is faithful to be a life-giver (lil Ellie as an example, and my big 5-0 next week! )….and i LOVE Life is Good products! What a fab giveaway! Bless you my friend! life is good because im not in control of it. I get to see the good, the bad and the ugly. But with the good I get to celebrate. With the bad I get to trust Jesus and in the ugly I get to trust that I will change with Jesus help. So no matter what comes my way Life is good! Thanks for sharing your heart Robin! What a great reminder that Life Is Good! You blog has been an encouragement to so many.. we’re praying for Stephanie and Elliot! Thanks for the giveaway! Jesus in his goodness has given His life so that I may live in Him. Each and every day I have the confidence knowing that I can do all things through Christ who strengthens me! Life is good…. So, if I win, please have coin toss for K & S.
LIFE IS GOOD BECAUSE GOD IS GOOD…. Life is good because I have a fiance who loves me more than life and a family that never ceases to amaze me….and a tiny little niece that gets to come home today!!!! Life is good because I get to experience it all over again through the innocent eyes of sweet Ava girl. Everything is a new & beautiful experience to her! 1. Ellie has dentist hair and a fo-hawk. 2. You claimed me as your surrogate daughter. 3. My dog went to the trainer and no longer tries to jump/tap dance on everything that lives and breathes. 4. I have a Soy Peppermint Mocha in my hand. 5. Physical Therapy starts for me Friday… hopeful that it will work! Feels like Christmas! 6. I found a word in the dictionary yesterday that means “nicely shaped buttocks”. 7. Four words: Purse. In. The. Yard. 8. Did I mention the Soy Peppermint Mocha in my hand? 9. The fact that I did not have to resort to rapelling into the hospital. 11. Free coffee cake this morning from the cute guy at starbucks! Again, I’m not supposed to comment back today…but Katie (Kate) really, how can I not??? We need more positive people out there with that “Life is Good” montra. Happiness is infectious. Oh Miss Gigi…If you thought Life was Good…Life has JUST started. The best is yet to be. Being a Gigi, or Nana, to little ones is the BEST! I have eight and the excitement is just as strong with each and every one. Oh what fun you will have! Tea parties, cuddling, sleep overs and lots of kisses, shopping, quietly reading books..while rocking, and then more cuddling. Being a mom was one of the best things in life, but I’ll tell you what! This time around I have the time to perfect this Nana thing! Have a beautiful day! Life is good because God allows me to get out of bed each day and enjoy the Love and Fellowship of an amazing family…………….The Roberts Clan. Thank you Lord for your Love and Mercy to me. Robin, your willingness to share with others is, to me, a reflection of how God wants us to love one another. My Father is sufficient for all my needs, each and every day, and I trust that His plans for my life are perfect…even if some of my prayers go unanswered. I’ve been blessed with a wonderful husband and best friend. I’ve been blessed with wonderful friends to share life with. I have a great family and great in-laws that love and support us in all things. I have two sweet puppy girls that make me laugh with their crazy antics. And I realize that everything else is just icing on the cake! I woke up this morning, God is merciful, gracious and good to a sinner such as I! Life is good for so many reasons… First of all because GOD is good! I have 3 healthy children, one being born early and has hydrocephalus but striving like any other 5 year old and in the top of her class in kindergarten… again, God is good! I’ve been with my husband for 10 years and we are still going strong! I have very good friends and supportive family… my car hasn’t caput on me yet. 🙂 I have no complaints, and no need to because life will continue on as it always does. Take the bad the comes and spit it back out… because it’s not welcomed in my life! Life is great because I set 5 more goals this year and I will have one check off the list in 5 days (half marathon). Life is great because God is looking over my Stepdad through his battle with cancer. Life is great my family and friends are healthy and happy. Because my husband is coming home today, and… Because I have stumbled upon your blog and it has brightened my day! One of my favorite things to remember is…. Life does not have to be perfect to be wonderful!!!! Learning to appreciate the small and ordinary things of life we have been blessed with….is good. Why I think Life is good? Life is good because you are beautiful, I am beautiful and if you really look at other’s we are all beautiful. We are all given a beautiful gift, the gift of life and the chance to make of it what we want. Life is good because if we truly believe and look past disappointments we will find hope, joy and usually precious angels sent down especially for each of us. Life is good because when I think I can’t go another day, I just look out my window and there will be a sweet bird, a single flower or child playing down the street and that will bring the smile back to my face… Life is really good, all we have to do is look! This is really thought provoking…and this may sound simplistic but life is good because there is a God and I’m not Him! His address never changes. You don’t need an international phone card to talk to Him, and He is the same yesterday today and forever…He loves me unconditionally, thank goodness, and He doesn’t even remember when I do awful things, He just forgives me. And He has put all the hidden messages in His word that are so much fun to find…. But if we are talking day to day life, and not life period…its good because I have a wonderful husband, not perfect, but I love him. I have been blessed with 4 wonderful children, they are pretty much perfect, and a fantastic extended family…and now on top of everything I’m a Auntie Granny…twice! The more I think about why life is good the “gooder” it gets! This was a great idea…we should do this everyday, no one would need prozac! LIfe is so good for my now just so different and wonderful being able to wake up to my adorable daughters face everyday. I sometimes wonder what got me up and out of bed and motivated before that. Life is good because no matter how frustrating my day has been, my 1 year old daughter can always make me smile. What a terrific post. I love Life is Good stuff. It is so cute and does remind us that everyday can be a good day if we make it that way. Thanks so much for this fabulous giveaway! Life is good and this is a great giveaway! Please count me in, thanks! Life is good b/c God is good! As I stand here and look at my precious 3 yr old..the unexpected gift from God..the unexpected gift from another woman to me, I am left speechless at His goodness. On the other hand as I sit here and wait for the phone to ring..one phone call that turns your whole life around…it’s cancer, my aunt has cancer..now the waiting game..where is it?, what kind is it? how do you trat it?..I am left numb, but deep down with a peace still that God is good! Look at you, rockin’ and rollin’ the giveaway!!! 🙂 Silly thing. Life is good because Miss Elliot is COMING HOME WHERE SHE BELONGS!!!!! And it’s good because I know now that her dentist hair is like “Hermie” and not “Herbie.” And life is good because Vicky admitted to thinking it was Herbie too, so I wasn’t alone. Life is good because I met you, dear friend. Very, very good. Life is good because I have realized that all that I need is all that I have and all that I have is all that I need! Congrats on becoming a Gigi! I am very behind in blog reading, so that was some great news. Your life is good! And,my life is good as I am surrounded by wonderful family and some true blue friends. That’s a gift for sure! Thanks for the great blogging…yours is one of my favs! Life is good because I have never been rejected by GOD. No matter how many friends you have or who you try to please, rest assured that GOD loves just me for who I am. There is no pretending, no false bravado, no facades to put up. For me that is the truest blessing of all. Life is good because people like you (may)give Life is Good things to people like me who think that you are someone who makes life good for a lot of people with your helpful, hopeful, happy blog. Life is good because I have a sweet two year old and a baby on the way. I’m so blessed to be a mommy! Life is good because no matter how stressful my day I always come home to my little chihuahua that is always so excited to see me. Life is good because God is faithful even when I don’t understand His ways. He is so patient and kind. Here I am, dropping by to thank you for visiting DesignTies and leaving me such a terrific comment about my bathroom remodel, and I see that you’ve got a lovely giveaway happening!! Yippie!! It’s taken a long time for me to figure out what I wanted to do with my life. I went to university, I raised a beautiful child on my own, I met, fell in love with and married a wonderful guy… and as much as those things made me happy, I knew there was something missing. I put the puzzle together a few years ago when I realized that I wanted to start my own Home Remodeling and Interior Decor business. The last year or so was spent dream about this idea… but over the last few months I’ve actually started to take strides toward making this dream come true. I have my first client (you should see the fireplace I designed/had built for her! ), Kelly and I started DesignTies, I’m working with a “brand specialist” to create a logo, business card, website and marketing plan… heck!! I’m making this dream happen!! Have fun reading through everyone’s entry – you have a lot of great responses above! Right now I have been struggling myself and while reading your blog I started thinking, it would help me if I stopped thinking about everything that is going bad right now and start thinking about what is good, so here goes. Life is good because I have 3 beautiful boys, and am lucky enough to be pursuing my dream of being a nurse to help others! Well, bright and early this morning I peeked at your blog when there were 8 responses. Now there are 48!! OMGosh!! I just gotta say, see, Rob? I told you. Keep writing. God’s all in, around, and through this. My kids make my life really good. With out them it wouldn’t be so exciting! I finally had to comment… because of the great giveaway of course.. such cute stuff! I found your blog, not sure how, but I bookmarked it because you are such a positive person and I love your take on life, your blog makes my day better! Life is good because God is in control. I have finally learned to live (most of the time!) like this and it makes all the difference in the world. Finally starting to get back in shape, losing 10 pounds and feeling stronger and more powerful! I woke up this morning and the things of yesterday are gone, the things of tomorrow are not here yet and today is what it is. God has it all and He loves me completely. All I have to do is just be, therefore life is good!! Because God has blessed me with two wonderful children (my best friends) and two super cute grandsons, Beckham (4) and Crew (2). I LOVE THEM All so very much! Love the bag in your giveaway!! Life is good because even though my husband and I are both unemployed we are blessed by having friends and family that loves us, and a God that provides for our every need! Life is good because grandchild #5 is on the way! Life is good. I just gave birth to my 5th child, my 4th son and every day my daughter smothers him in kisses and confirms that she does indeed love having brother! Love the bag! Just want I need for my stuff! Life is Good…..beeeeeeeeeeeeecause GOD is GOOD!….He has given me so many wonderful gifts…and I am truely blessed to be married to my best friend and soul mate! Life is VERY Good. God has been so faithful to me and my family even when we have not been always faithful to Him. I’m in love with God. Love the bag and hat. Thanks for a chance to win it. Life is good, because on September 2nd I will have my very first niece/nephew! I will also be the godmother to this little blessing and we can’t wait! Thanks for this giveaway! Life is good because I have a wonderful husband, and pets that I adore! I get to fulfill my creativity, and I also have friends who keep me laughing! Thanks for the great giveaway! Life is good because my poor little coughing two-year-old daughter is feeling much better today. Thanks!! Life really is good. I try to remember that everyday! Life is just good and God is amazing! Just watching Ellie and hearing how she is growing just makes me smile. Life is Good products are wonderful! Seriously? You’d think someone wouldn’t want that giveaway?? WOW I would LOVE to have that!! It’s awesome!! For me life is good, because we live on a beautiful farm like we’ve always wanted to do, we make descent pay and right now as long as people still eat pork we aren’t in jepardy of losing our jobs. Although my heart goes out to the families that have! I can’t believe you were worried about people not liking it. I think both the hat and bag are way cute. Life is good because I have three beautiful daughters and a wonderful husband to love and share it with me. Life is good because I have a little girl that teaches me to enjoy life’s little moments. Like singing, dancing, picking flowers, going on picnics, having tea parties, reading story books, and sneaking cookie dough. Life is good because being a mom- is getting to play like a kid all day. Tiy are so silly! Look at all the comments already. This is a great giveaway. Thanks for the great giveaway! Love the bag, endless amount of uses for it! That bag is so cute! Life is good..My little girls are healthy and happy and smilin’. Thanks for the giveaway! Life is good cause God has given me super family, wonderful husband 3 beautiful daughters, 3 super fun grand children. And some of the greatest blogging friends ever. But, this is the 1st time I have ever written to one. Thank you for sharing you life story, love, & testamony. This has given me inspiriation to begin. Life is good for me because I have my health, a job and people around me who love and support everything I do! Love it! Life is so good right now because my son just tested negative to eggs and wheat after 9 years!!! Life is good because my little girl is finally at home where she belongs! Life is good for me because I have two beautiful healthy sons and a great husband. Thanks! Life is good for me, I am a new Mama, with a healthy baby, I am healthy, have a job, a great husband, food in my mouth, and a roof over my head! I have a loving family, caring friends and wonderful co-workers! I could go on and on, but I won’t…most of all though life is good b/c I am here on earth! Life is not only Good but it’s great! I have a wonderful husband and baby girl Leah who is 8 months and brightens up my day everyday! I also have a Heavenly Father who loves me and knows who I am, I also have loving friends and family! What could be better than that? I WOULD LOVE TO WIN THIS…and I do believe that Life is GOOD. It’s a gift from GOD that we shouldn’t take for granted! I have four beautiful children, a loving & caring husband and a great life. I couldn’t ask for more…but I would love to win this too! LOL! You are so cute!! I love this give away!! Life is fabulous because I have 3 wonderful boys, a husbands love, a roof over my head and food to put in our tummies! So i think we are doin pretty good!! I totally dig LIG stuff ! Thanks for the chance to win! Life is good because tomorrow is Friday!! Life is Good because we are all remembering it, talking about it, and thanking Him on this blog! I loved reading all the comments! Life is good because I’m living it happily! There are so many reasons life is good for me, I guess the most important one is by God’s grace he has saved me. I have a great family, a job, and good friends. fun giveaway! Thanks! I already have a few life is good items love them! Life is good when I’m around my sweet daughter. That’s a great giveaway! I love the bag especially. But the hat’s adorable too! My life is good…because God gives me far more grace and love than I can even imagine. Fun giveaway! The world needs more positives these days! Life is good…because I have 2 little boys that still think I’m cool! My 15 year old son and I were in a horrible car accident this week…on the German autobahn no less! We both were able to crawl out of the van after it flipped over with nothing more than a tiny scratch on one finger. We are living ,breathing testimonies to God’s sovereignty and that makes Life Good! Besides……Calvin shouldn’t be the only one with Life is Good products in the house! Life is good because my husband finally has an interview! Life is good because I will soon be a Grandma again – my first grandson was born early and lived only 3 minutes, his mama found out she had kidney failure and God has blessed her with a transplant and now the possibility to adopt another son. All happening in the last year. God is in control – life is good! Life is good because I have a God who loves me despite my many shortcomings! I love the idea of this giveaway. Life is Good! I love your giveaway items! Life is good! I became a grandma again on 2/18/09. Natalie is my second granddaughter and she’s beautiful! Her gorgeous sister, Mackenzie, is one of my best pals! Life IS good! Even better when you become a “gigi” don’t you think? I love your grandma name! Mine is Mimi. Hiope I win. Love your blog.